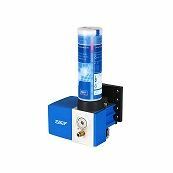 SKF’s new electric cartridge pump. It includes an integrated pressure-relief valve that enables its use in single-line lubrication systems such as SKF’s MonoFlex. The Electric Cartridge Pump ECP is easy to operate with a space-saving design and uses 380 ml cartridges so it is compatible with both oil and fluid greases. The electrically driven piston pump uses 24 V DC and is controlled by an external programmable logic controller (PLC). In addition, the Electric Cartridge Pump ECP is capable of manually activating a lubrication cycle and can be used with an optional, integrated level switch to monitor the fill level of the cartridge. The new ECP pump is on show at Jimtof, the Japan International Tool Fair (17 – 22 November 2016) and SKT’s stand is in West Hall 2, Booth W2054.